In my last article I looked at 135mm Lenses in general and the Pentax offerings in particular. That overview considered those made for the Pentax-specific K-mount, but also those for the M42 mount, which is easily adapted to Canon, Nikon and other systems. In this article I'll be looking at some of the third-party offerings, and again much will be applicable no matter what system you use. With dozens of brand names and hundreds of models, where does one start? I went to the various forums and blogs where people chat about such things and gathered up as many recommendations as possible. Thirteen lenses were tested by Michel Pollet on a Canon, five of which I could strike off my list since they were zooms or incompatible with Pentax (your criteria may vary). 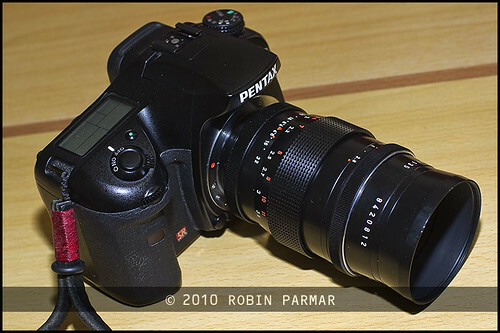 Seven lenses were tested by Dave on Pentax Forums. A related discussion managed to list 40 possibilities. My selection criteria includes image quality, portability, price and usability. Since I didn't have the opportunity to try any of these, I based the selection on common recommendations, examination of sample images on Flickr, and so on. Along the way I discovered such rarities as the Vivitar Telephoto 135/1.5 Professional, which was produced in a tiny batch in 1968 and sold for the equivalent of $2,400! It is fair to say that this is a collector's piece and not something I'm going to stumble across on eBay for fifty quid -- the price point I am targeting. First up is the "Carl Zeiss Jena DDR MC S 1:3.5 F=135mm", a simple optical design of 4 elements in 3 groups that has stood the test of time. Though it is in fact a Sonnar, for patent reasons it bears the abbreviation "S" instead. This M42 mount lens weighs 430g and is 89mm long, but extends to maybe twice this length. It is thin for a 135mm, taking a 49mm filter. It is an "auto aperture" with the A/M switch I described in SLR Aperture Control Mechanisms. The minimum focus is 90cm and minimum aperture f/22. The diaphragm has 6 blades. This lens is black with a large ribbed focus ring. For convenience it has a built-in lens hood that retracts when not needed. I love this design since it makes the lens more portable. There is an earlier "zebra" styling, but it's not multi-coated. 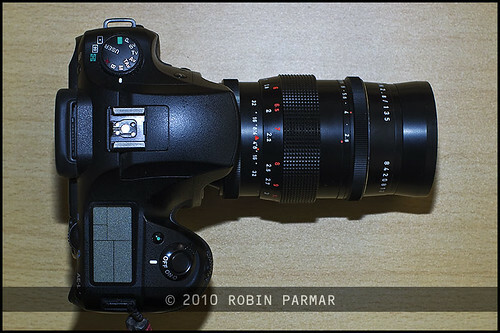 SLR Lens Review has test findings of the MC version, which are very positive. The Carl Zeiss Jena sells for £50 to £80. The second option is the "Vivitar Series 1 135mm 1:2.3", from back when Vivitar were a first rate brand that had only the best Japanese companies manufacture their glass -- in this case Komine. I have their 28mm from that same series and it is excellent, especially when one considers it is an f/1.9! But back to the 135mm which uses 6 elements in 6 groups and is reputed to be quite sharp (but not the absolute pinnacle). Available in a variety of mounts, including M42 and K-mount, this lens is a hefty solid metal 675g and 88mm long. For convenience it also has a built-in hood. The lens is an unusual shape, flaring out significantly to a 72mm filter. The minimum focus is 89cm which provides a maximum reproduction ratio of 1:4.5. Like the Jena, the minimum aperture is f/22, though it ups the blade count to nine. The Vivitar Series 1 listed for $220 in 1977 but now goes for a reasonable sum (£80) in off-brand mounts but sometimes double or more for Pentax, since it has something of a reputation in those circles. The blog Making Not Taking has some lovely photos of this item. There is also an earlier version that lacks the coating and the neon blue VMC lettering that advertises this fact. The Pentacon 2.8/135 Preset weighs 470g and 112mm in length (including the hood), has a 55mm filter and minimum aperture of f/32. The minimum focus is only 150cm, which can hardly be called "close" focus! It comes with a dedicated screw-on hood and is commonly found with a hard case -- I believe this was included with the lens when initially sold. Though it is superficially similar to the Carl Zeiss Jena, this lens is an updated 5 element in 4 group design. Following the many models already mentioned, the company released "Auto" and "Electric" versions. These have automatic apertures and only 6 blades. They are multi-coated but reportedly do not offer the same smooth out-of-focus area or gentle rendering. Avoid buying one of these lenses by mistake. A quick glance at even a poor photo will reveal if the preset ring is present. At the top of this article you will find a picture of the fourth version of the Pentacon 2.8/135 Preset, on my Pentax K20D. To my eye this is one handsome lens! The build quality is excellent and it is neither too long nor too heavy. However, the mount is so narrow that the body contacts are exposed, so I'd think twice about taking this out in inclement weather. The following profile view highlights this problem. Why did I buy the Pentacon over the other two recommendations? No reason really; it just happened to come up for a good price. I am sure I'd be equally happy with the others. But I must say I was intrigued by the idea of 15 blades, wanted an East German lens in my collection and thought it looked fab. Besides which, this is my first preset aperture lens and my first with stepless aperture control. So it's a great learning experience! If you have a little more to spend, don't forget the Takumars and other Pentax lenses mentioned in the last article. Whichever lens you purchase you'll find working at 135mm on a cropped sensor to be a new photographic experience. how much is your pentacon preset one? thanks! I bought the Pentacon for €62, which was a steal! Thank you for this great guide! Just wanted your opinion on something? I'm thinking of getting my first manual lens. I've found a Carl Zeiss Jena and a Pentax Takumar Preset (no SMC, etc.). Both are around the same price - £70 ish, 135 mm with f3.5. Which would be more worth getting? I'm more interested in landscape / 'wild life' (aka little critters in my garden) than portrait & I've got a crop sensor, the Canon 550D. Please let me know! It's hard to say which you might like more and, as I say in these articles, there are so many different 135mm lenses out there to choose from, while I have used only a few. That said, it is difficult to go wrong with a Takumar. They are just so beautifully made and handle like a dream. However, if you want to shoot very small critters (insects) you might want a macro lens instead. Of course those will be more expensive. Even if you still with a 135mm, pay attention to the minimum focus distance. The Taks can't focus closer than 1.5, 1.8, or even 2m, depending on the version. That means you can't get up close and personal. In fact, it is even difficult to aim down at the grass for something without getting up on a small ladder! The Jena focuses to .9m minimum focus, which is far more usable. But the Queen of such lenses is the Vivitar 135mm f/2.8 Auto Telephoto Close Focusing, to give it the full title. It can focus down to 59cm, enough to provide 1:2 magnification. By today's standards that would be called a macro lens. I have one, and it takes exquisite shots, especially for portraiture. "Even if you still" -> "Even if you stay"
The Jena is the DDR MC-S with 1:3 mag .. I've been reading good things about it! The Taks are the one with 15 blades .. the so called bokeh monster. Man, I wish I could get them both but £70 x 2 is kind of out of budget for me this month (poor student). Also, sorry for the annoying questions, but in terms of adapters, I was thinking whichever I get, I'll get an individual one for each lens (I buy in the future) just to avoid damaging the threads, etc. I looked into cheap aluminium ones on Ebay (these are in the UK apparently), both with and without an AF chip. I also checked out the Fotodiox everyone keeps praising (its more expensive). 1. I've heard that apparently some AF chips can damage the cam body. Would you say to get one without the AF chip? I'm planning on checking the focus on Live View anyway ... any point of getting it? 2. If its not worth the trouble (even though loads of people apparently don't have an issue with the AF chip) and better to get a chipless adapter, is the Fotodiox worth the extra £20 than the cheaper ones on Ebay? Also (sorry for so many questions! ), is the Tak Preset better than a Tak with Super coating? 135 mm with F3.5 as well. Both roughly the same quality but the Supers are around £20 cheaper! I don't know anything about adapters for Canon, but I know that most people say that you get what you pay for. On Pentax cameras I was using proper M42 to K-mount adapters made by Pentax. These cost 3x or 5x the price of a cheap knock-off. The difference is that the flange is precisely milled. This matters if you want to maintain infinity focus. And also have a nice tight fit without any play. On a budget you might prefer to try the budget adapter. I certainly understand that motivation! I don't understand the questions about AF couplings since these old lenses are in no way electronic. It's manual focus and manual aperture all the way! No need for an adapter with any electronics AFAIK. I am sure the internet is buzzing with other opinions. Photographers like nothing better than to discuss such details to death! I don't know the details of the different Taks (there were six f/3.5 and three more f/2.5 models) but Pentax Forums will have articles in their review database. I would say it is preferable to buy the lens that is in the best condition, regardless of variant. Of course you simply don't know what history a given sample has. There is no doubt more variation between samples than between the models. P.S. Coating matter a lot to avoid glare and flare, even when using a hood. In controlled situations (e.g. studio) that matters less, of course. I don't think there are any official adapters so I have to make do with cheap ones! You can get adapters that have a built in chip which tricks the body into believing you have an electric lens and so makes the camera beep when you get a focus (no idea how it works) .. I am sure you'll have fun. For me, manual lenses beat the new auto-everything stuff. I simply take better pictures when I am moving slower.